to add a pretty detail. Of course there has to be one on the other chair too. Where did those wonderful crewel deer pillows go? They went across the room to the sofa! There really is not much change here. 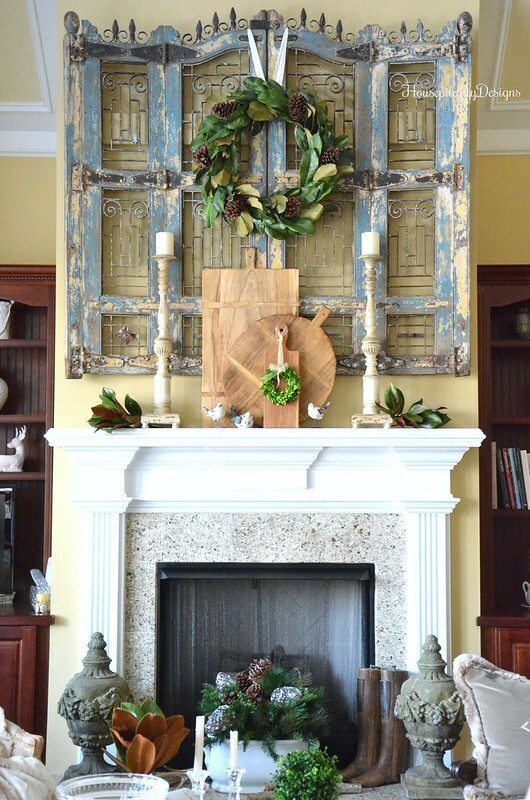 and added some magnolia branches to each side of the mantel. The bottle brush trees were put away and the Winter birds flew in. It’s nice to be able to transition from Christmas to Winter with such ease. and making certain there are lots of candles for a warm winter’s glow. How do you create your warm winter’s glow? and the icy roads melting! Shirley, what a perfect winter room. The fur trimmed and monogrammed pillows are a great addition…love the texture of the pine cones…the magnolia wreath is wonderful any time of year. You have transitioned into winter with style! 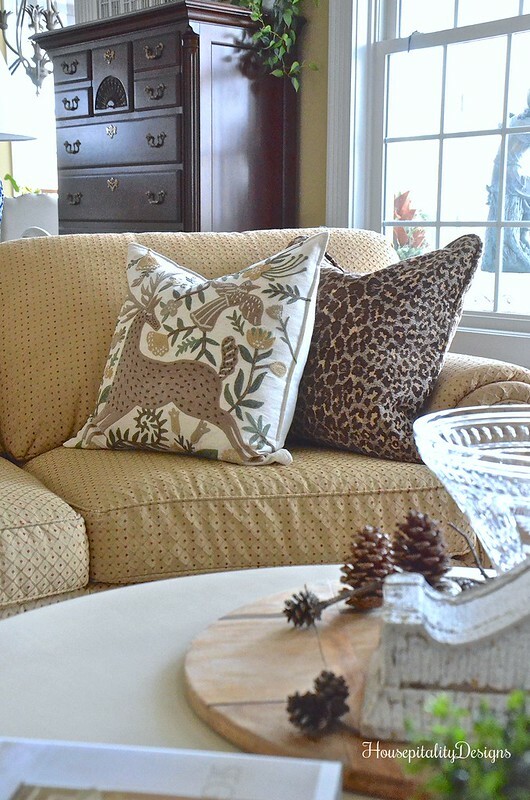 I love your fur trimmed monogrammed pillows and the crewel deer pillows against the leopard is ooh la la! Beautiful transformation! The pillows are wonderful. I’ve transitioned my room but not necessarily with a winter theme. We just got iced in here and pretty much everything is shut down for a bit. 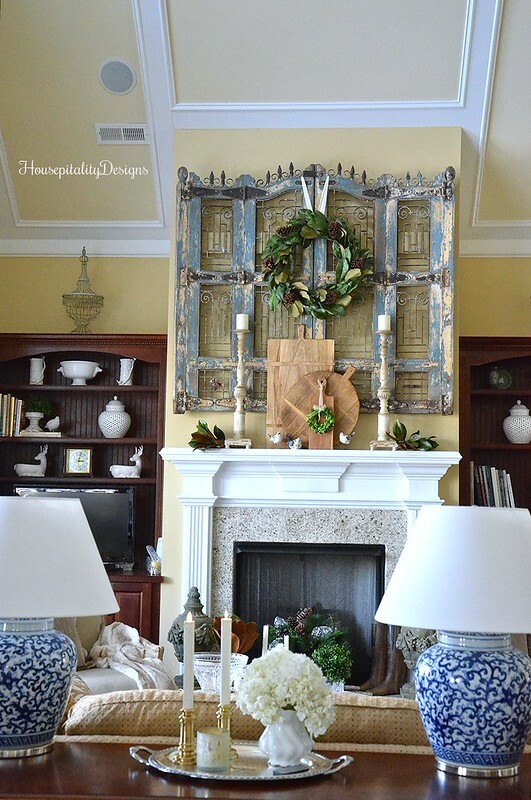 infusewithliz.com’s recent post…Reclaiming the living space after the holidays! so pretty and cozy! 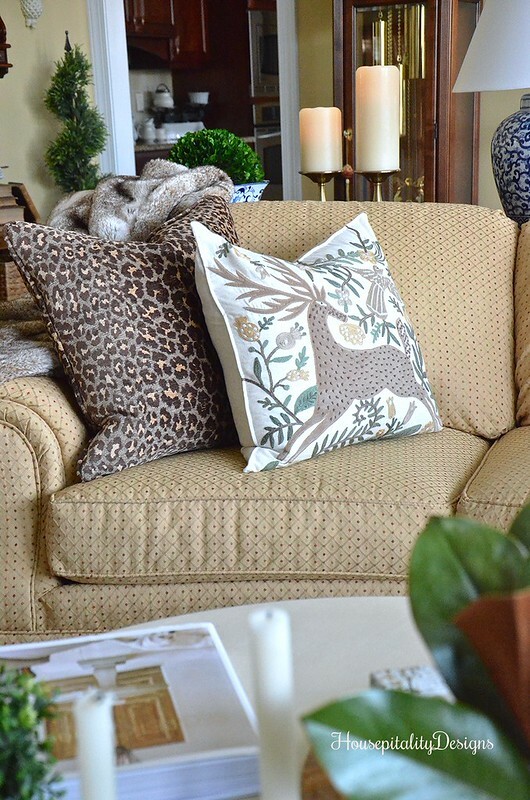 I love the new monogrammed pillow additions and your deer pillow looks perfect paired with the animal print on your sofa! So cozy! 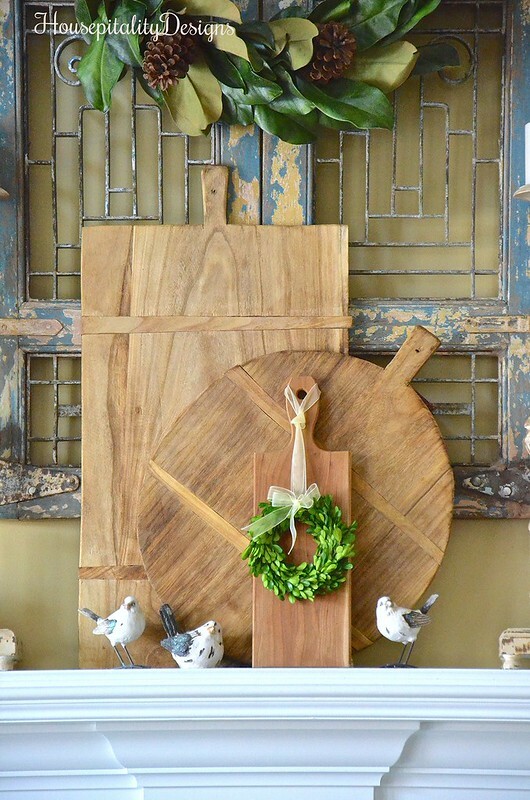 Love your new fur trimmed pillows and the sweet birds on the mantel. I’m having envy-flashbacks as I view the photos of your room. The sofa pattern brings back fond memories of the Country French sofa I sold (years ago) when I had my store. It was in a cream & beige check and would have fit right in with your room. Love your style! Your transition to Winter theme is just beautiful! You have such great classic taste!! Love those monogrammed pillows. My winter theme is woodland, snowy with my collection of Snowmen. so lovely and cozy. You have such a gift of pulling things together. I love your home. Will you share the paint color? Your winter living room looks so beautiful!!! 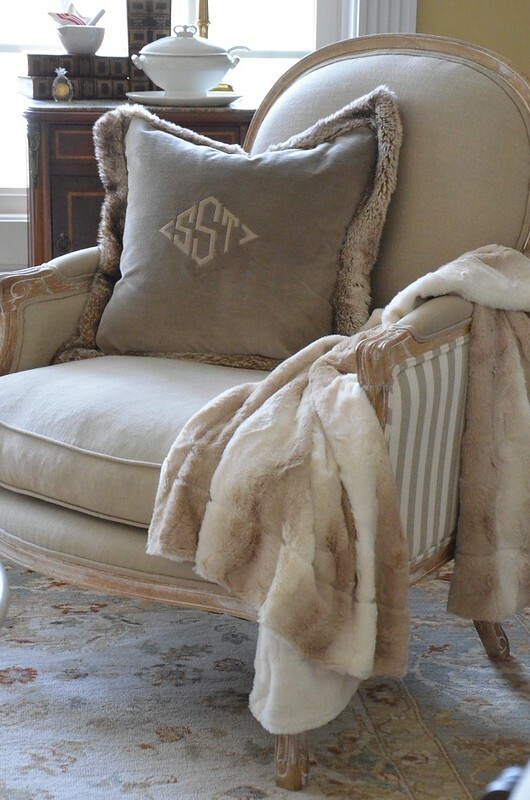 I absolutely LOVE those monogrammed fur trimmed pillows…gorgeous!!! I love the blues and whites, so restful. Your winter living space looks very cozy and a place I could settle in till spring! Oh my, the great room looks…..GRRRRREAT!!!!! Sorry, couldn’t help myself!! 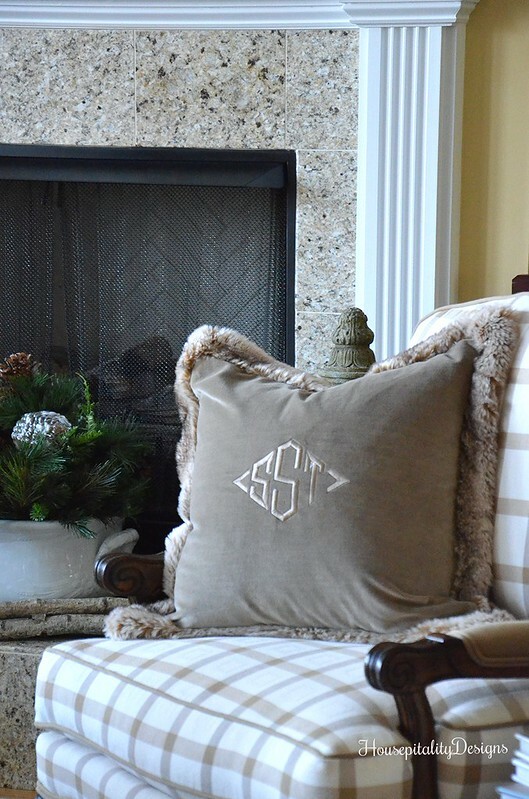 I LOVE the fur trimmed, MONOGRAMMED pillows! Gorgeous! Of course I love the deer pillows against the leopard! Beautiful! I have brt out some winter décor for my great room too and IF my computer cooperates I will share it all soon!!! Like tomorrow:) Have a great rest of your day. Where do you go for the monogramming? I don’t know anyone around here that does that. Are they pillow covers that you can just take? why ‘of course’….they look beautiful monogrammed. love the way you think! hope you are having a great week. Your pillows are so elegant and luxurious. What a gorgeous room with such charm. You make changing things around seem so effortless which makes me envious. The monogram is a great touch. 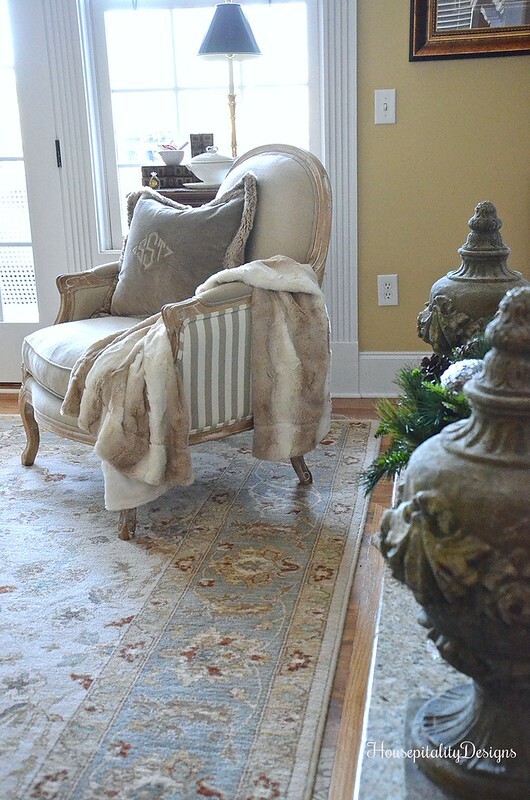 Your winter design is cozy, inviting, and classy. I love all the pillows. You just have the best touch, Shirley. I know the room has to look gorgeous on an evening that you use your candlelight. Thank you for the inspiration. “Icy roads melting” sounds like just what I’ve been wishing! It’s very warm today, so maybe finally our roads will clear. Your room looked spectacular decorated for Christmas, but I just love this winter look! Everything looks warm and cozy but not heavy, just so very lovely. Question: where do you have things monogrammed? I think it is the perfect transition Shirley. Mine was simple too. 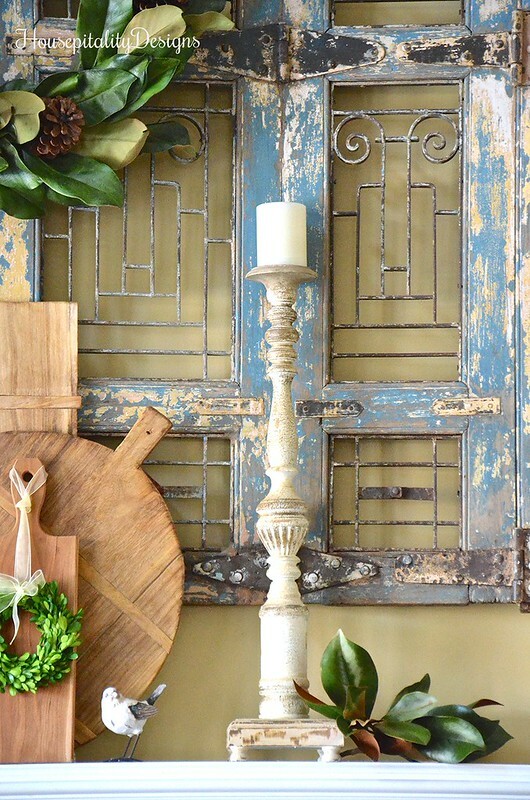 When you decorate with pinecones and greenery, it’s a breeze to ease right into the winter season decor. The neutrals in your family room are absolutely beautiful! The new pillows are a perfect addition. What a great find! So pretty, Shirley. I added birds to my mantel too, in the form of a poster. Pillows are such a great way to quickly and easily change the look of the room. Love your new pillows! Such a pretty room! I love all the color choices and love the luxury throw. Your mantle is amazing. Your room is so lovely! I especially like your new pillows and your rug! !